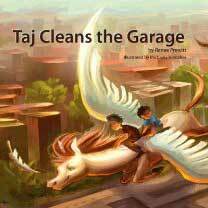 Taj Cleans the Garage is a beautifully illustrated children’s book for ages 2-7, about a little boy who does a chore that turns into an exciting adventure. In the process he becomes a hero! Taj always wants new cars for his train set, so his parents encourage him to start earning the money to buy them. Much to his surprise, Taj’s new chore turns into an exciting adventure where he is the only one who can save the day. Renee’s second book in this series, Malcolm Mows the Lawn, is also available.